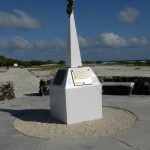 On Wake Island the United States Marine Corps memorial stands tall, a stark white spire against a blue sky. Nearly fifty years since its dedication in 1966, the memorial remains well tended and frequently visited. Marines passing through Wake pay their respects year after year, often leaving medals and pins or picking up a paint brush to give the memorial a fresh white coat, as a visiting general did last week. The defense of Wake Island in World War II is a proud legacy of the Marine Corps. When war came suddenly and without warning to Wake on December 8, 1941 (December 7 on the other side of the international date line and just hours after the Pearl Harbor attack), the 1st Defense Battalion included 15 officers and 373 men – about 40 percent of the number required to man the guns batteries on the island. Total military personnel on the island numbered 524, with 449 marines (including medics and personnel of VMF-211), 68 navy, and 6 army personnel who maintained non-combat functions on the atoll, plus one unlucky sick sailor put ashore from a submarine. With several hundred civilian volunteers, these Wake Defenders held the atoll during a punishing sixteen-day siege before falling to an overwhelming land invasion on December 23, 1941. In the dark days following the attack on Pearl Harbor, the nation was buoyed by the news that “Valiant Marines Hold Tiny Isle,” when the Wake defenders thwarted the first attempted land invasion by Japanese forces. On December 11 the Japanese entered the second phase of their assault on Wake. While the Chitose Air Group “softened up” the atoll with three days of blistering air attacks the Wake Invasion Force made its way north from the Marshalls under the flag of Rear Admiral Sadamichi Kajioka. The task force consisted of three cruisers, six destroyers, two transports and other support. Close to five hundred men of the Special Naval Landing Force prepared for the amphibious landing. The invasion force steamed toward Wake, buffeted by heavy winds and high seas. A sharp-eyed night patrol detected the approaching surface force at about 3:00 A.M. and alerted Major [James P. S.] Devereux. Devereux calculated that Wake stood its best chance by holding fire until the invaders were well within range of the shore guns. All battle stations stood ready in the dark. Two hours later, as dawn broke, the lead ships reached eight thousand yards south of Peacock Point, turned westward and, raising no reaction from the quiet, dark atoll, opened fire along the south shore as they maneuvered broadside. Shells hit the fuel farm at Wilkes channel setting oil tanks ablaze; the cruisers and transports closed range, firing with impunity at their prize. . . Still the Wake guns held their fire until the lead cruiser reached about 4,500 yards due south of Peacock Point. At last, Devereux gave the order for the five-inch batteries to commence firing. The shore guns and range finders had suffered damage in previous attacks, but Battery A on Peacock Point now threw off camouflage, opened fire, and hit the cruiser (the task force’s flagship), which raced away, returning fire to no effect. Battery L on Wilkes fired on multiple ships in its field, including destroyers, transports, and other cruisers. One destroyer took a hit straight on, exploded, and sank with all hands. Under fire on Peale, Battery B answered another Japanese destroyer approaching from the west. With one shore gun disabled the battery nonetheless concentrated fire on the target and scored a hit, sending the destroyer smoking in retreat. By 7:00 A.M., the entire Japanese task force had turned in retreat. The flagship smoked away from Wake, visibly listing, shooting back all the while until it disappeared out of range. The four armed and airworthy Wildcats had taken to the skies before the surface force came in range, found no enemy carrier or air cover for the invasion attempt, and now mercilessly harried the retreating task force, repeatedly returning to the airfield to refuel and rearm with hundred-pound bombs and .50-caliber ammunition. In ten sorties Wake’s tiny air force bombed and strafed the retreating ships, damaging at least two more light cruisers, a transport, and a patrol boat, and thirty miles southwest of Wake sank one destroyer outright. Japanese losses in the first attempted land invasion included at least two ships sunk, four heavily damaged, and several hundred dead. Wake counted two Wildcats damaged, one irreparably in a forced landing on the south beach, some shell damage to shore batteries and installations, and four wounded personnel. It was a proud morning for the Wake Defenders, but just one chapter in their courageous stand. I am deeply grateful for their service and for the civilian volunteers who aided the defense (the civilians were awarded veterans’ status in 1981), and I understand why the paint doesn’t get a chance to chip on the USMC memorial on Wake Island.